The Australian Football League (AFL) today announced it would partner with Australia-wide Insurance Broker JLT (Jardine Lloyd Thompson) for the pre-season competition for the next three years, with today’s launch of the JLT Community Series in Melbourne. AFL General Manager Clubs and AFL Operations Travis Auld joined with JLT Chief Executive Leo Demer to announce the fixture for the 2017 JLT Community Series, which will see all 18 teams play three matches across a four-week stretch between Thursday February 16 and Sunday March 12, to lead into the 2017 Toyota AFL Premiership Season. ‘JLT is an incredibly important contributor to the game as they are the driving force behind our National Risk and Protection program for community football leagues around Australia, and we are delighted they have chosen to partner the AFL for our pre-season competition. ‘JLT provide an exceptional service for all 18 AFL Clubs and our State Associations, and ensure that our players and volunteers are protected, and now they will have a key role as football returns in 2017,” he said. Mr Demer said JLT was delighted to raise the level of its partnership with Australia’s only indigenous game, as the spread of matches across all parts of Australia reflected its role in supporting the game no matter where it was played. “Every AFL player across one of the AFL clubs began his career in a small community, be it in a metropolitan, regional or country area, that has followed his every step through to reaching the elite level,” Mr Demer said. “At JLT, we support football communities in every part of Australia who love the game, and the JLT Community Series will take matches to so many locations across the country where fans can see their favourite stars up close. “I am delighted to be able to announce that in 2017, games will be played at Manuka Oval (ACT); Albury, Blacktown, Coffs Harbour and Narrandera (New South Wales); Broadbeach and Mackay (Queensland); Mt Gambier, Noarlunga and Richmond Oval (South Australia); Launceston (Tasmania); Arden Street, Bendigo, Casey Fields, Ikon Park, Moe and Whitten Oval (Victoria); Geraldton and Mandurah (Western Australia) as we play more matches than ever in community locations,” he said. 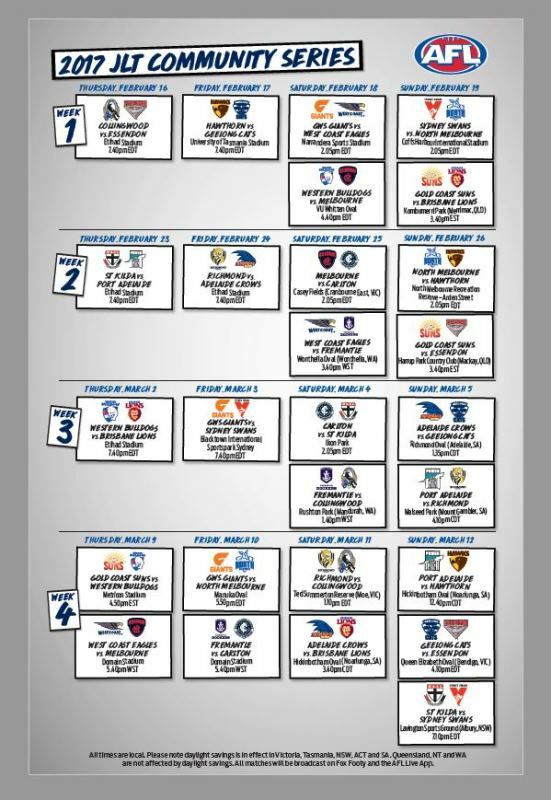 Six matches will be played across each of the first three weekends of games - giving all clubs one bye - with every club playing on the final weekend. Mr Auld said the first match of the JLT Community Series will see Collingwood play Essendon at Etihad Stadium on Thursday February 16 while reigning premiers the Western Bulldogs would return to their spiritual home at the VU Whitten Oval later that weekend, when they host Melbourne on Saturday February 18. Newly-appointed Brisbane Lions’ coach Chris Fagan will have an immediate introduction to senior ranks in the opening weekend of the competition with a cross-state match-up against the Gold Coast Suns at Kombumerri Oval, Broadbeach. Mr Auld said the AFL was delighted that all 27 matches would again be exclusively broadcast on television live by Fox Footy and, in addition, every match will also be made available live to fans via the AFL Live App. For the third successive season, AFL club members with game access will be entitled to attend next year's matches free of charge, subject to availability. “Many of those communities cannot regularly access AFL football during our premiership season, due to distance or other constraints, and it is incredibly important that we take matches in the JLT Community Series to venues that don’t usually host games when we have the opportunity to do so,” Mr Auld said. “I wish to thank Foxtel and Telstra for continuing to support our game with the decision to support all 27 matches in the 2017 JLT Community Series with a live telecast.